Part yearbook, part insider’s travel guide, and part collected memoirs, Our Portland Story is the result of an ambitious, very Portlandesque endeavor. But mostly, it's a love story. Spearheaded by Portlander and graphic designer Melissa Delzio, Our Portland Story was conceived as an experiment in community collaboration. 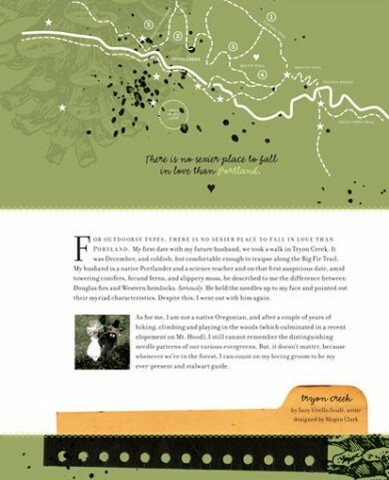 Paragraph-sized stories were paired with graphic interpretation and the resulting words-and-pictures were edited into a coffee table book that will be available for sale starting with a gala launch party this Thursday at Mississippi Studios, in North Portland. I submitted my Portland love story several years ago, then forgot about it until the day the e-mail arrived announcing its inclusion in this Vol 1 edition. In the two years since I've gotten a few e-mails now and again: one when the designer assigned to my story, Megan Clark, had two design options the editor wanted me to consider, and then, as the launch date grew near, announcements about the party. What's particularly exciting to me about watching this process unfold, is that it sort of marries my day job and my passion, satisfying both sectors: the marriage of words and pictures, and the creation of a love story involving many voices. Oh yeah, and since as of next week Portland will have been my home for 21 years, its fitting that this homage marks the day that my residence status is finally old enough to order a martini!